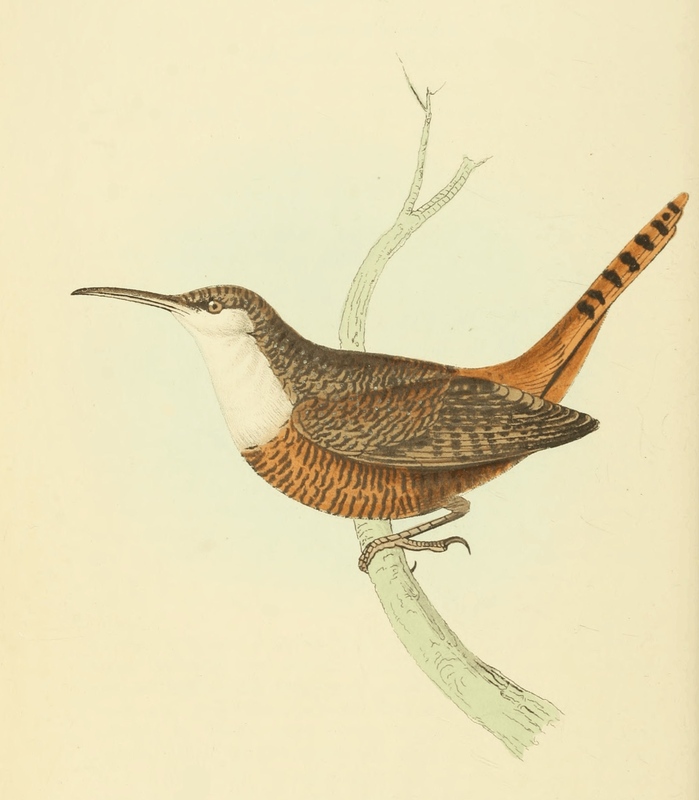 This beautiful book plate is a drawing of a white breasted wren or Thryothorus Mexicanus, as it was called by the author of this 1829 work. The genus thryothorus appears to have been split into several others and from what I could tell is no longer used. I don’t think it is the same bird, but there is a White Breasted Wood Wren who is also identified as being native to Mexico. So, I will share what the book had to say about this bird. Just keep in mind, if it matters for your project, this bird drawing may be misidentified. This species has a longer bill than most wrens and its hind toe is also longer. My guess is this pretty bird drawing represents a bird that has since been re-classified – perhaps as a Creeper since the text mentioned it was a bit similar to Creepers. Or, as I have sadly seen with several other animals and birds, it may no longer exist. This bird was described as having a 5½ inch long bill, 11⁄10 wings, with a tail of 26⁄10 and a tarsi of 7⁄10. Whatever you call the pretty bird in this vintage drawing, I think it is a fine example of the hand-colored book plates of this era. The original artist, engraver and colorist were not identified which is truly a shame. It was included in Zoological Illustrations, or Original Figures and Descriptions. Volume I, Second Series by William Swainson.